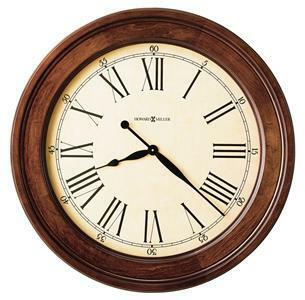 This large 30" diameter gallery wall clock finished in Americana Cherry on select hardwoods and veneers, is lightly distressed for an aged appearance. Aged, antique dial is easy to read from a distance and features black Roman numerals, seconds track and black hands, and glass crystal. Quartz, battery-operated movement requires one AA sized battery (not included). Made in the USA.